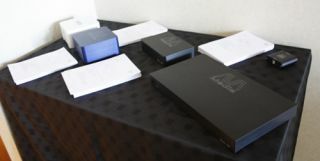 BRISTOL SHOW 2013: AVA Media reveals three new digital amplifiers | What Hi-Fi? AVA Media has chosen Bristol for the world premiere of a trio of new digital amplifiers to join its compact AVA Maestro-50, which we'll be testing shortly. The £999 Maestro-150P (above right) – the 'P' standing for Precision – has casework cut from a solid aluminium billet and a claimed power delivery of 60W into 8ohms. It has four digital inputs, capable of handling 24-bit/192kHz files, a pair of analgue inputs and a subwoofer out. There's also an optional USB upgrade module capable of handling 24-bit/384kHz audio. For those who want a copmac digital amp for mobile or marine applications, the Maestro-50M is designed to run off 12V or 24V DC power. It has two digital inputs, each capable of handling 24-bit/96kHz audio, and a subwoofer out. Power delivery is a claimed 20W into 8ohms. But what most caught our eye was the £249 AVA Maestro-50S, created to work with the Sonos Connect wireless network player. Its designed to sit either on, beneath or alongside the Connect, and again has two digital inputs and a subwoofer out. Power is 20W (8ohms). Look out for our review of the original AVA Maestro-50 on whathifi.com soon.